One of the other founders and I had a really fun time on Friday as we headed down to the San Antonio Auto Auction (SAAA). This trip was particularly exciting for me, as I had never been to an auto auction. We sold a 2006 Chevy Equinox to a customer named Marie last week and the vehicle was located at the SAAA. Instead of having the vehicle shipped to us, we thought we’d make the short trip and pick it up for her ourselves. Dealer-only auto auctions are essentially comprised of massive parking lots filled with cars, an administration building that houses most of the auction employees that take care of payments, transportation, inspections etc., and the actual physical auction lanes themselves. Cars come down through these lanes and are unsold when they start and then get bid on and are sold by the time they come through the other end of the auction lane. 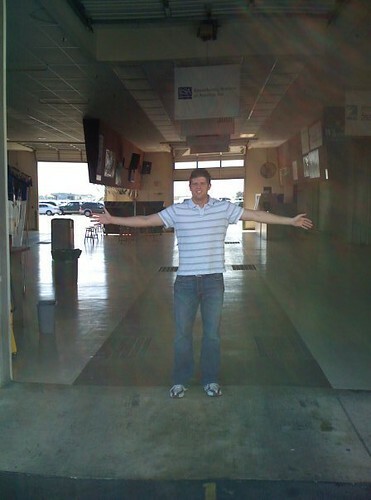 Here I am standing in one of the auction lanes after the auctions had finished. Sorry girls, I’m not currently for sale. The physical space that the full auction occupies is astounding. Furthermore, the activity going on at these auctions is really overwhelming to a newbie like me. This auction was run by Manheim and they employ over 35,000 people at there auctions worldwide and I can now see why. We also took the opportunity to test drive a BMW 325 that a customer had expressed interest in earlier in the day that happened to be at the SAAA as well. We ended up selling him a different BMW located in New Jersey that he should be receiving next week. I drove the Equinox back to Austin and Marie took possession of the car today. Marie seemed really ecstatic about the condition of the vehicle and I really hope she enjoys her new ride. We’ll post some pictures of Marie and her vehicle soon on the site. what is needed to get an and purchase at auctions? and what auction places? Be careful not to put your business model on a blog. Car guys are keen to still your ideas. What is the current state of Evenlevel.com? You have to get into an auction and experience the energy. Very cool to watch.